Justin P. Gooch is a driven attorney who works diligently to further his client’s best interests. Justin grew up around the legal profession. His father is a retired Assistant County Attorney and continues to maintain a law practice. In law school, Justin was a member of the Journal of Animal and Environmental Law and Interstate Mock Trial Team. 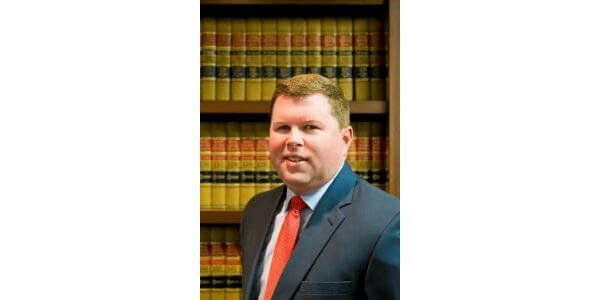 He clerked for his father, along with another well-established civil litigation firm, and the Jefferson County Attorney’s office. Upon graduation and passing the bar in 2011, Justin accepted a position as a Prosecutor for the Jefferson County Attorney’s Office. He worked in that office for two years, handling thousands of cases in varying realms. Justin joined the Schuler Law Office in the fall of 2013. Justin also is an avid horse racing fan and worked in the horse racing industry during high school and college. In high school, he was a tour guide for the Kentucky Derby Museum. While attending the University of Kentucky, he decided to climb the ladder in the Thoroughbred Capital of the World. He got his start at Claiborne Farm, mucking stalls early each weekend morning. He then accepted a position with the Jockey Club where he assisted in registering approximately 30,000 new foals each year. Finally, in 2006, he joined WinStar Farm as a bloodstock assistant to Elliott Walden and Doug Cauthen. Justin’s other interests include basketball, running, and soccer, where he currently coaches a three-year-old team. Justin’s practice involves criminal defense, civil litigation, personal injury, equine issues, wills, and probate. He is admitted to practice in Kentucky and the U.S. District Court for the Western District of Kentucky. He is a member of the Louisville and Kentucky Bar Association as well as the Kentucky Justice Association.